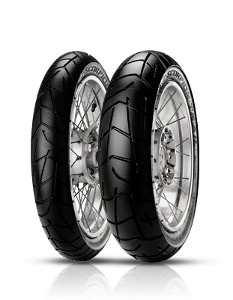 The Pirelli Scorpion Trail tyres are designed to suit Enduro motorcycles that have a touring setup. It can take part in long excursion rides and even light off-road trips. The tread pattern is revolutionary and therefore offers very good road handling capabilities apart from having a contemporary look. The steel belt at 0° makes sure that the tyres offers better stability and handling on all types of road surfaces. The use of modern day compound ensures that the tyre offers maximum traction during any weather. The Pirelli Scorpion Trail tyres that suit 17-inch front rims are 120/70 58W and 120/70 58V and the tyre specs that fit 17-inch rear rims are 120/90 64S, 130/80 65S, 130/80 65H, 140/80 69V, 150/70 69V, 160/60 69W, 180/55 73W and 190/55 75W. The tyre specs that fit 18-inch rear wheel is 150/70 70V. The tyres you can buy at Tirendo.ie that fit 19-inch front rims are 100/90 57V and 110/80 59V and tyres that suit 21-inch rims are 9090 54S and 90/90 54V. All the tyre specs have to be read as tyre width/height and load and speed indexes respectively.